1960-1970 Massachusetts REJECTION Sticker - $20.00 : Bob Hoyts Classic Inspection Stickers, Add a Final Touch to your Restoration! 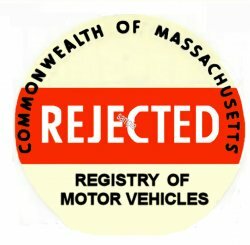 This Massachusetts REJECTION sticker is not dated and is perfect for you renegades who want something different. It is ideal for RAT RODS and all kinds of street rods. It is a restored and reproduced sticker issued in Massachusetts during the 60's for vehicles that failed inspection.